Several costly issues can arise when subclinical ketosis lingers in your herd. Firstly the fresh cow needs to get rebred and this condition can delay rebreeding. Secondly, early lactation culls and death losses are attributable to this. Why wait to get the cow on the milk line and then lose her productive period to this preventable condition? Thirdly – of course milk production loss and veterinary costs. This article explains in more detail the interest a dairy farm should have in monitoring subclinical ketosis. There are strategies you can use to have a surveillance in place. So lets go to the fresh cow: She is subjected to her lactation which places a lot of drain on her system. As a consequence, animals drop into negative energy balance and mobilize body reserves including muscle protein and glycogen for milk production, direct oxidation, and hepatic gluconeogenesis. In part – muscle breakdown in early lactation provides substrates for milk production. When a cow has more muscle tissue it offers up this as an extra aid in supplying the udder with enough nutrients to make milk. The Fleckvieh breed offers this advantage especially when crossbreeding with more traditional strictly dairy type cows. These types of cows are bred with udder capacity only in mind and less so other traits such as feet and leg strength for example. On top of all this: The cow needs at least twice the amount of energy compared to pre calving. She needs to constantly eat and have access to water. She has to be comfortable and have space. You need to be on these girls to make sure they eat and drink. How? 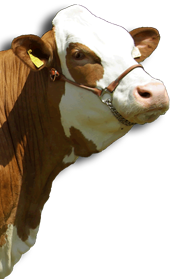 Place a large visible timer clock on your fresh cow pen and and ensure that someone checks on the cows every 45 minutes. If the checks are missed, the negative consequence of a sick cow will result. One of our dairy farms that we work with has put a system in place where the pay of all employees gets docked if this is not done. What kind of sick cow? Well let`s see: displaced abomasum, metritis, fatty liver – all this leads to decreased milk production and vet costs, treatment and medical costs and time as well as culling or even death loss. Very costly – I quote here from The Canadian Vet Journal that indicates a financial loss of $289 USD per case of subclinical ketosis. This occurs when cases are not identified in time and treated accordingly. A small fraction of animals with subclinical ketosis go on to die. This relates to their pre-existing condition in the dry period – the most critical period in the dairy farm. The Fleckvieh breed offers greater resilience to this condition because a larger energy reserve is present and can be mobilised from skeletal muscle as glycogen, therefore the “beefy” appearance of the medium frame sized cross bred or pure breed Fleckvieh pays dividends right here. About one quarter of the collective cost of losses from this condition manifest as reduced milk production. Same goes for delayed conception. That can add up fast to one half of the above mentioned $289 USD per case. So you need to implement cow monitoring in the early lactation (in the first week of lactation). 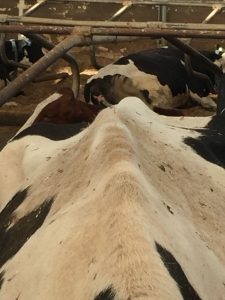 This can be done in batches of fresh cows – a chute near your pen, walk them through and take a drop of blood and run a test to detect ketone bodies which are a manifestation of the onset of this condition. The best test in fact is a blood test ( milk or urine test are not as precise). There are hand held devices available to use ( e.g. Abbott Freestyle Neo ). When cows begin to develop Ketosis, a chemical called beta hydroxybutyric acid ( BHB) becomes present in the blood stream. This is your indicator that treatment should be initiated. Fatty liver syndrome is the accumulation of fat within the cow’s liver. Fatty liver occurs as a result of the cow breaking down too much fat for the liver to process properly. Fat mobilization occurs as a result of negative energy balance of early lactation. The broken down fat is then converted back to fat in the liver to prevent the animals from becoming toxic. Thus the liver becomes fat when the cow is losing condition, the more loss in condition the more fat in the liver. 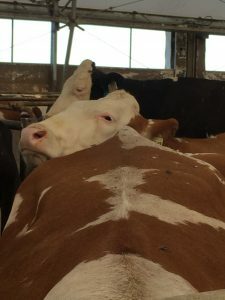 If a cow has next to no skeletal muscle mass, then she needs to count on her fat reserves even more than a well muscled cow such as a Fleckvieh. Fatty liver can develop within 24 hours of an animal going off feed. This is typically around calving time. Once it is deposited in the liver, the concentration of fat in the liver does not fall until the cow gets into positive energy balance, which can be over ten weeks after calving, particularly if the fatty liver is severe. Fat cows (Body Condition Score greater than 3.5) are much more prone to fatty liver. They are basically predisposed to this condition due to excessive condition at the wrong time. Note the lack of muscling on the rump of this cow. She gets run down real fast. The cost of Subclinical Ketosis to dairy farms can be greatly reduced with consistent monitoring and a simple blood test. Prevent delayed rebreeding, early lactation culls and milk production loss.